Teeth reshaping , is a process that consists of enamel polishing areas to change the length, shape or appearance. This method is frequently used to improve the look of a person – offering harmony or a balanced smile. Reshaping teeth are among the most simple and effective treatments in this field. The procedure is quick and painless and results can be seen immediately. Remodeling is not recommended in cases of serious dental problems – such as large cracks, fractures or major flaws. Often this procedure is used in combination with treatments, coronary reconstruction to ensure optimal results. If you consider to reshape your teeth, talk with your dentist first if there is a proper procedure. What are the steps to be followed in reshaping teeth? 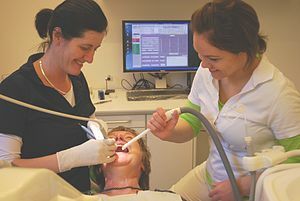 Initial examination – To determine if you are a candidate for remodeling teeth, the dentist will need to make your dental X-ray in the first phase, which will give information on size and location of the tooth pulp (the area where there are nerves and blood vessels). If the tooth’s enamel layer is too thin or if the pulp is too close to the tooth surface, remodeling is not possible – and other procedures must be taken into account. The procedure itself – Determined once the intervention, the dentist will shape the teeth by creating balance and proportions you want, then will be added fluorinated gels. Remodeling is not an issue, anesthesia is not necessary in principle, but just in case of hypersensitivity. Period “after” – Generally, a simple reshaping without being followed by more difficult procedure, requires no post-treatment monitoring period. Though several sessions are recommended for maintaining healthy teeth, fluoride respectively.